The new year is a new opportunity to refocus on your goals. As an older adult, you have a lot that could make your resolution list. From health and wellness to family to-do’s, making goals and sticking to them will help support a bright future. Here are seven resolutions that could make a big impact in 2018. Eat more fruits and vegetables: No matter your age, fruits and vegetables are part of a healthy diet. The USDA’s Choose My Plate program states all adults should eat at least five servings of fruits and vegetables a day. Choose produce, rich in vitamins and minerals, in a variety of colors to ensure you get plenty of different nutrients. Dark leafy greens, bright citrus and red berries are just a few tasty examples. Consider supplements: Talk with your health care provider about supplements you could be taking, especially if you’re on a restrictive diet that could impact your intake of various nutrients. A daily multivitamin is a good conversation starter, but there are many others to consider based on your unique needs, such as omegas, fiber, vitamins D, B, K and more. Stay physically active: No matter how many years young you are, it’s important to stay physically active. Mild to moderate physical activity with minimal impact can do wonders for the body and mind. 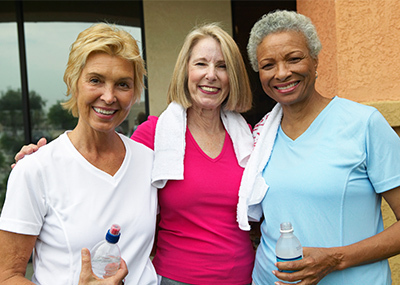 Walking with a friend is an easy way to get started, but other activities to consider include tai chi or signing up for stretching or water aerobics classes. Why not have fun and try something new in the new year? Stay mentally active: Your mental health is just as important as your physical health, so make time to give your brain a workout, too. Reading, crossword puzzles and Sudoku are simple activities that can be done virtually anywhere. Join a club to play cards, bridge, or try a new creative skill like painting to learn new things that challenge the brain grow new brain cells. The socialization is wonderful for staying positive and connected. Update legal documents: Whether you’ve created them years ago or have been putting the entire process off, the new year is a great time to update legal documents. This includes things like wills or advance directives including a living will or power of attorney documents. For assistance you could contact an attorney or consider a low-cost technology solution. Stay socially active: Research shows that social connection improves quality of life, [EA2] but it can be harder to stay socially active as you age. This year, make your relationships a priority. Set up a weekly time to chat or have dinner with family members. Get to know your neighbors by exchanging phone numbers in case of emergency. Or consider joining a community organization or church group. Have important conversations: Have you been putting off having tough conversations with your family? You’re not alone. The new year is the perfect time to finally tackle these tasks. Talk with loved ones about your future needs, including things like moving into an assisted-living community. It can be difficult to start the conversation, but you’ll feel so much better after you do. What other resolutions are on your list for the new year? Leave your thoughts in the comments!